Hvar is the island of many superlatives: the most beautiful, the most popular, the most visited, the sunniest... the list goes on. Such place is in no need of recommendation; you simply must see it for yourself. It is easy to get lost in countless opportunities for a great vacation that this island offers: from its matchless natural beauty, immense historical heritage and the ideal climate, to its rich nightlife offer, irresistible gastronomic wonders and luxury accommodation. So give over to the overwhelming beauty of Hvar, dive into its countless possibilities and make your wishes for a perfect summer holiday come true. According to the respectable magazine “Traveller”, Hvar is among the ten most beautiful islands in the world. Surrounded by the crystal clear and throughout the warm part of the year pleasantly warm sea, Hvar is the perfect summer destination. Its untouched, naturally beautiful beaches leave even the most demanding visitors speechless. Hvar is often emphasized as the sunniest part of Croatia. It has been calculated that this sunny island is agleam by the yearly average of 7 hours of sunlight a day. It means that the bathing season starts very early and lasts longer than expected; from early May to late October. The summers on Hvar are typically warm and dry, making this part of the year perfect for your vacation. But, thanks to the mild and pleasant winters and the rich tourist offer throughout the year, Hvar can be a lovely place to visit in the winter or autumn as well. 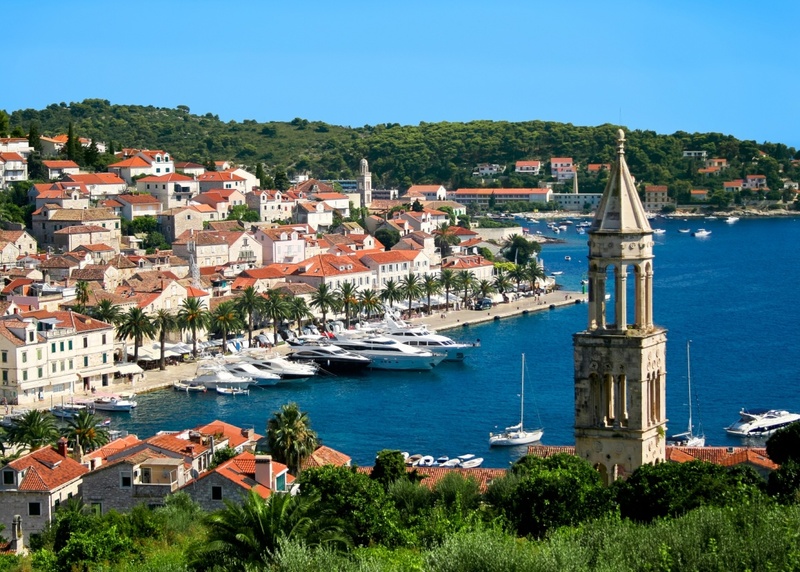 According to the historical writings and the archaeological findings, Hvar hosts one of the oldest cities in Europe. It has been inhabited since the prehistoric times, 6000 years ago; but the ancient Greek city of Pharos (today’s Stari Grad) was formally founded in the 4th century before Christ. There are numerous preserved monuments and archaeological findings confirming that theory. Thanks to its rich tourist offer; a wide range of comfortable accommodations, irresistible gastronomic wonders and a diversity of nightlife options, Hvar has often been rated as the most popular and the most visited place on the Adriatic. The majority of fashionable nightclubs and bars are located in the city of Hvar, making it the party center of Dalmatia. Numerous celebrities such as Beyonce, Kevin Spacey or Andre Agassi have visited Hvar in the past summer seasons. You can seek the most suitable accommodation in one of the island’s hotels or explore numerous private accommodation options ranging from simple rooms to luxurious private villas. Hvar is proud of its rich gastronomic offer and quality wines served in every local restaurant or tavern. Be sure to taste the specialties of the island’s specific cuisine characterized with the simplicity of preparation and the freshness of used ingredients. Fish and seafood specialties, such as black risotto, octopus salad or grilled sardines will awaken all your senses and imprint some more unforgettable memories of your lovely vacation on the Island of Hvar. Find information about selected Hotels, apartments and rooms in Hvar to choose the perfect place for your accommodation.